The palm trees are the first things you notice after stepping out of Palm Springs International Airport and into the California breeze. It’s a sight I grew accustomed to in my hometown of Savannah, Georgia. In Atlanta, not so much. Wanting a change of scenery without draining our savings on an international honeymoon, my newly minted husband and I had opted for the California desert as our post-nuptial celebration destination. Palm Springs is known for its concentration of midcentury modern homes. From the 1930s to well into the ’60s, Palm Springs was a popular destination for Hollywood notables. During these decades, both tourism and housing boomed, particularly in the winter season when droves of people flocked to the warm locale to escape chilly temps. These days, the town is decidedly sleepier, though no less picturesque. 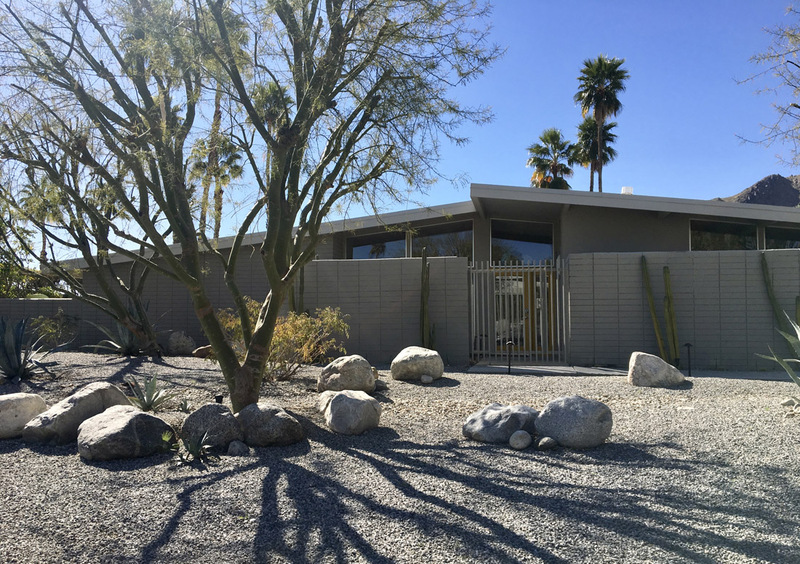 Not ones for a typical tourist experience, we rented a 1959 mid-century modern home nestled in the scenic Racquet Club Estates neighborhood. The place was outfitted with a heated pool, a hot tub and unbeatable views of the San Jacinto Mountains. After settling in, we headed out for a handcrafted cocktail at Bootlegger Tiki, a watering hole known for its Instagram-worthy pours and fun atmosphere. I opted for the Valkyrie on Vacay, a concoction of aquavit, pear brandy, blackberry, lemon, passionfruit, Aperol, ginger and soda. The next morning, in need of coffee and still operating on East Coast time, we made our way to the early side of the breakfast rush at Cheeky’s. The hip-yet-laid-back breakfast and lunch spot boasts a seasonally rotating menu of fresh dining options with a true Cali flair (check out the $8 açai kale slushie). Sitting on the sunny patio, my husband found it no easy task to choose between options of sourdough French toast with fresh figs, heirloom tomato tartine with lemon aioli or the chilaquiles (a traditional Mexican breakfast dish featuring lightly fried tortilla pieces that appears on too few Atlanta brunch menus) with queso fresco. I chose the classic breakfast quesadilla with chunks of bright-green avocado. Purple Palm restaurant serves up New American cuisine in an eclectic atmosphere. Since we’d already landed on downtown Palm Springs’ Palm Canyon Drive, we digested our meal while meandering the city’s walk of fame, dubbed the Palm Springs Walk of Stars. Honorees include everyone from Marilyn Monroe and Elvis Presley to Leslie Nielsen and Kathy Griffin. Speaking of Elvis, we’d be remiss to have a Palm Springs honeymoon without visiting the Elvis Honeymoon Hideaway. 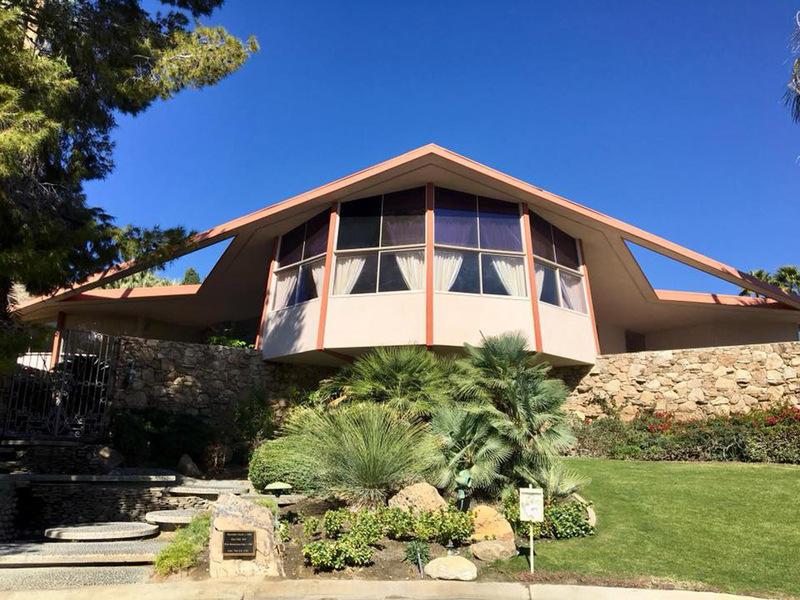 Situated at the end of an unassuming cul-de-sac in the Vistas Las Palmas neighborhood, the circular mid-century modern home was originally known as the Alexander Estate until Elvis and his bride, Priscilla, stayed there post-nuptials in May of 1967, effectively transforming it into an iconic destination. It was too early for tours to begin, but they’re offered twice every afternoon. Elvis and Priscilla Presley honeymooned at the Alexander Estate in 1967. 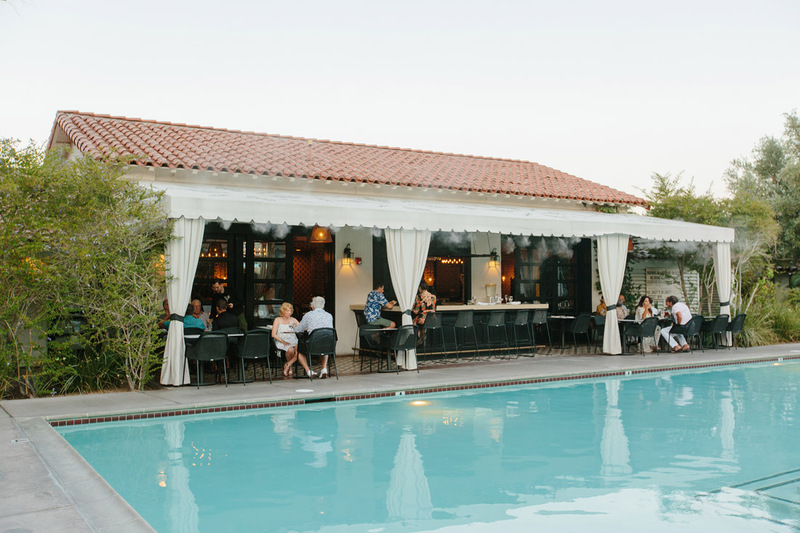 After a lazy afternoon of lounging poolside, we headed back downtown for a fancy dinner at Purple Palm, the restaurant inside the Colony Palms Hotel. It’s a stunning eatery decked out with bold Schumacher wallpaper, Moroccan fringed chandeliers and mosaic-tiled floors. Helmed by Chef Nick Tall, the kitchen serves up self-described New American cuisine. While dishes of seared sea scallops and 12-hour pork shank are clear menu stars, as a longtime herbivore, I was pleasantly surprised with my dinner of strozzapreti pasta with baby artichokes, grilled mushrooms and pine nuts. My meal was complemented with a Dutch rum, pineapple, lime and maraschino sipper called Desert Gold, a decidedly fitting title for the cocktail—and the trip as a whole.